AMHARA REGION, 05 June 2014 – Kossoye Ambaras is a small lush green village within Wogrea woreda in northern Gondar where it is relatively cold. Amarech Ashager, a 28 years old mother of two, is used to the weather as she lived her whole life here. At the top of her daily agenda is making sure that her family, especially her youngest son, Metages Birhanu of 9 months, is well fed. Like many of the residents, Amerech does not rise out of bed before 7 a.m., as it is too cold to leave the house. She begins her day by breastfeeding Metages and cooking breakfast for the rest of the household. Her husband, Birhanu Tagel, is a businessman and her eldest son, Muluken, 10, is a third grader. After saying ‘good day’ to Birihanu and Muluken, Amarech will cook breakfast for Metages. Since he was introduced to solid food only three months ago, Metages eats exclusively porridge. Preparing highly nutritious porridge for a child is a technique that Amarech has recently learnt. The base of the porridge, the flour, contains various grains and legumes. For breakfast the added ingredient besides the flour is an egg and minced cabbage. As well as cooking the food, feeding the child to achieve best results is also a discipline. Amarech has learnt to feed her child while also playing and talking to him to keep him engaged. Amarech and other mothers in the village get support from Health Extension Workers (HEWs) on how to properly raise their children. Today, HEWs Habtam Dese and Yeshiwork Tesfahun are weighing the children in the village to monitor their health and development. They too receive assistance from Gebeyaw Alamerew, the woreda Nutrition and Child Health Officer. In a typical session with a HEW, a six-month-old child will receive a vitamin A supplement, while those aged above one year will additionally receive deworming tablets. With the support of UNICEF, this has become a routine service in the woreda. Out of 18 children weighed by the HEWs , 16 are in the average weight range. Amarech is one of the happy mothers to learn that her son, Metages, weighs 8.6 kilograms, well in the range of a healthy baby’s weight. “I am so happy that he has gained a few more grams since last time,” she says, smiling. After weighing babies in the community, Habtam and Yeshiwork demonstrate how to make a child’s diet balanced and about the importance of using iodised salt. As the child-friendly food preparation simmers over a fire, the two mothers, whose children’s weight was under the average limit, get counselling on how to improve their baby’s weight. Gebeyaw believes the woreda has come a long way. “In previous years, there were up to eight children per month in Kossoye suffering from Severe Acute Malnutrition (SAM), but this year there have been no cases,” he says. “This is because we monitor the children’s growth and give counselling and other packages of support to the mothers at the earliest stage possible, as we did with the two mothers today.” When the food has finished cooking, Habtam and Yeshiwork let the mothers feed the warm nutritious preparation to their children. The afternoons in Kossye Ambaras are usually foggy this time of the season. Amarech has subsequently decided to do her laundry the following day and so turns to preparing dinner as well as other domestic chores. For Metages, she has a new menu in mind: adding mashed potatoes and carrots to the porridge. She says she will also never forget adding iodised salt to the food. “Habtam has told us that iodised salt is key to a child’s mental growth. She also told us that we have to put in the salt after the food is cooked and out of the oven so that the iodine does not evaporate with the heat,” she says. 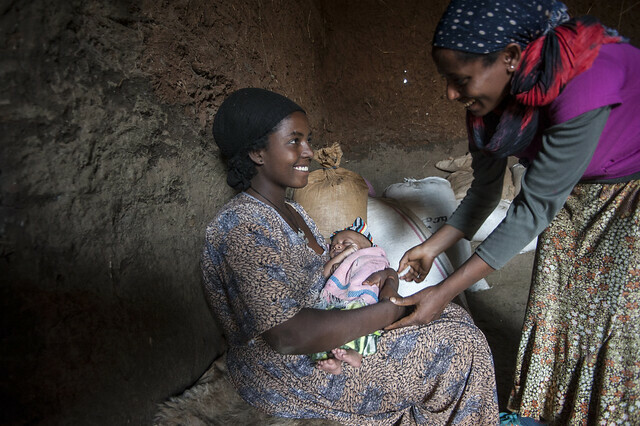 Habtam is one of 38,000 government salaried HEWs currently providing nutritional and other support to mothers and children across all regions of Ethiopia. 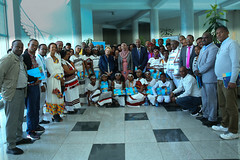 Development partners such as UNICEF are committed to support this initiative. 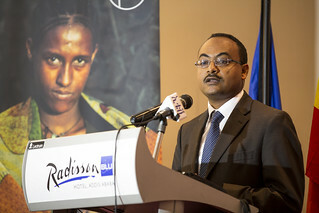 “Nations will face critical bottlenecks to economic growth if a large proportion of their working-age people’s IQ and productivity are limited by under-nutrition,” says Dr Peter Salama, UNICEF representative in Ethiopia. The Community Based New-born Care (CBNC) initiative was launched in March 2013, following the national policy breakthrough of allowing Health Extension Workers (HEWs) to treat new-born sepsis. The programme is supporting four agrarian regions: Amhara, Tigray, Southern Nations Nationalities and Peoples’ Region (SNNPR) and Oromia. One of the methods and tools used during the four day CBNC training in Ethiopia is a training video produced in English, Amharic and Oromiffa. The video helps to make CBNC training more productive through presentation of communication skills and specific technics and procedures performed by Health Extension Workers in a rural setting of Ethiopia. Though, first and foremost produced to support the four-day standard training on CBNC, the individual components of the video can be used also to support specific separate skill’s training like; Measuring Temperature; Weighing the Baby; Hand Washing; Essential New-born Care; and Expressing Breastmilk. The video demonstrates components designed to follow the principles of continuum of care for mothers and new-born. ADDIS ABABA, 17 April 2014– close to 2 million mothers and new-borns in Ethiopia are to benefit from improved maternal health and new-born care services. 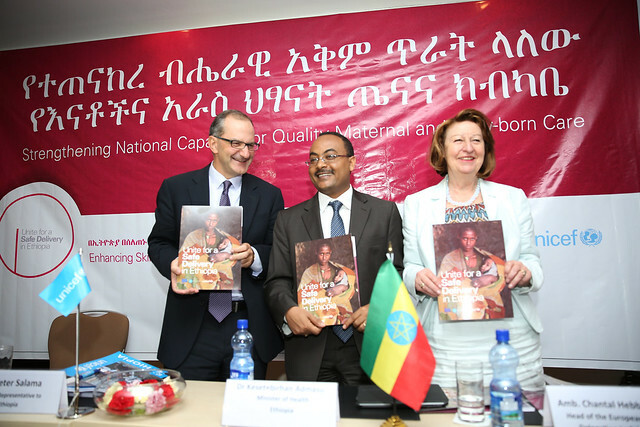 Enhancing Skilled Delivery in Ethiopia (ESDE), a joint initiative between the European Union, Federal Ministry of Health and UNICEF, aims to increase access to and utilisation of quality maternal and new-born health services. ESDE is a 1.1 billion birr (€40 million) project financed by the European Union for a three-year period, from 2014 to 2016. Of this grant, €20 million is allocated to the Millennium Development Goal (MDG) pool fund of the Federal Ministry of Health (FMoH) and the remaining half to UNICEF. 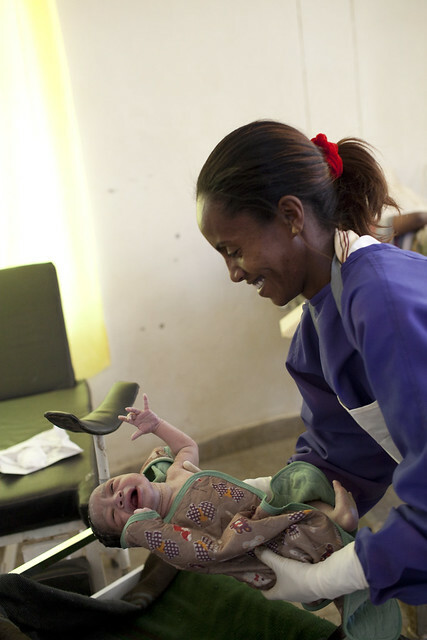 This maternal health initiative represents one of the largest grants to maternal health ever provided to Ethiopia. ESDE will be implemented jointly by the Federal Ministry of Health and UNICEF, with the support of other development partners and health professional societies working in the area of maternal and new-born health. ESDE comes at a time when Ethiopia is working hard to achieve the MDG target 5 of reducing maternal mortality, which is not yet on track. Currently, Maternal Mortality Ration (MMR) stands at 676 per 100,000 live births while Ethiopia hopes to bring down the level to 267 per 100,000 live births before the MDG deadline. ESDE project is expected to benefit 625,000 mothers and new-borns annually from improved access to maternal and new-born health services – a quarter of annual national deliveries. Why maternal health matters in Ethiopia? Only 29.5 per cent women delivered in Health Facilities. MMR is 676 per 100,000 live births, while the expected MDG 5 target is to bring the level below 267 per 100,000 live births by 2015. In Ethiopia, up to 15 per cent of mothers and new-borns suffer serious complications that warrant referral to facilities providing Comprehensive Emergency Obstetric and Neonatal Care (CEmONC) services including caesarean sections, blood transfusions and emergency laparotomy. However, the availability of CEmONC has been limited to only over a hundred hospitals having the capacity to provide the service in the country. The government sets ambitious targets for 2015 MDG deadline including availability of Basic and Comprehensive Emergency Obstetric and Neonatal Care (BEmONC and CEmONC) at 100 per cent of hospitals and health centres in the country. Increase skilled birth attendance rate to 62 per cent of total deliveries and universal access of mothers and neonates for antenatal and postnatal care. The construction of over 800 new primary hospitals [one primary hospital per woreda (district)]. The construction of over 200 hospitals has already been initiated in the various regional states and is expected to be completed soon. The hospitals need to be equipped with basic supplies and equipment to provide maternal and neonatal care including equipment for basic operation facilities and essential neonatal care equipment. Obstetric and new-born care supplies and equipment for 500 health centres and 50 hospitals. Operation theatre equipment for 30 primary hospitals. Training for 5000 health extension workers in community based new-born sepsis management. Obstetric and new-born care training for 250 doctors and health officers from 100 hospitals. Emergency obstetric and new-born care training and supportive supervision for 1000 midwives and nurses. By Haile Gebrselassie, Save the Children Child Ambassador, two-time Olympic Champion and four-time World Champion. 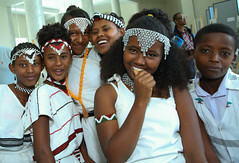 Ethiopia, my country, is the cradle of humanity. The first stone tools were found here and Lucy, a 3 million year old skeleton and the first Homo sapiens, was found in the village of Hadar, on the southern edge of the Afar triangle. Our history is ancient and continuous. We are fiercely proud of the fact that we are the only African nation never to have been colonised. But like every nation our history is chequered and we have suffered. In 1983, when I was ten years old, the first flames of hunger were flickering throughout Ethiopia. It was that year my mother died due to birth related complications. In those days, in my village, this was not very unusual. My mother died following birth complications. The women of the village tried to help, but when I think back I realise that none of them really knew what they were doing. In so many ways, we have made progress in saving the lives of mothers and their newborns since then. Today, the number of children dying before their fifth birthday has been halved since 1990. The number of women who die in childbirth has declined by almost a third – that’s millions of kids who get to grow up with a mother and millions more getting a chance at life. What we have achieved so far must be celebrated. The actions of our governments over the last fifteen years have brought about the greatest leap in children’s wellbeing survival in history. This change has been brought about by bold political leadership at the highest levels. But even today, half of all women giving birth in sub-Saharan Africa give birth without any skilled help. Globally, 2 million women also give birth completely alone. A direct result of this lack of skilled health workers, as Save the Children has shown in a new report today, a million newborn babies die on their first day of life. A single baby’s death is one death too many. The good news is that we know what needs to change: ensuring every birth is supported by quality trained health care workers who have the expertise to help premature babies survive, deal with birth complications and prevent newborn infections can, with some wider steps, help prevent as many as two-thirds of these newborn deaths. Every country in the world must ensure that all mothers-to-be have access to a midwife with life-saving medicines and equipment. 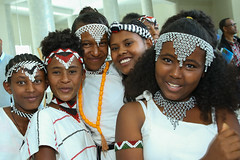 Africa is finally a continent on the rise – and children are the key to our continuing success. I want them to grow up to be the doctors, lawyers, teachers and even athletes that they are meant to be. The race for survival is a marathon, not a sprint. We are in this for the long haul. Like long distance running, this will take endurance, commitment and conviction. We have seen the incredible results when we put our minds to it. The prize for these children is much greater than an Olympic medal. They get a fair chance at life, regardless of how poor their parents are, where they live or whether they are a boy or a girl. This is a race that we can win.